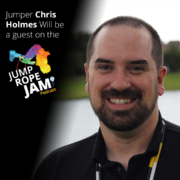 Today I had the pleasure of being interviewed for the Jump Rope Jam podcast. It will air in a couple of weeks, and I’ll be sure to share it here once it goes live. We discussed some of the history of our sport and I shared some of my favorite videos with them. It was so much fun that I’m sure we’ll do it again. I had a great time talking with hosts Cory and Eilea. Once again I’m reminded why I love Jump Rope so much… it’s filled with great people that truly have a passion for the sport. Please go check them out and support what they are doing.